Rhodes: a Greek island retreat that offers beauty in all directions and stories of brave knights in castles and courtyards. Rhodes is the picture-perfect island off the coast of Greece that sings of medieval charm and alluring topaz sea waters. With a small local population of around 100,000 residents, you can count on being intrigued by this beautiful city that once housed knights and royalty. Popular attractions include The Palace of the Grand Master and Lindos village. 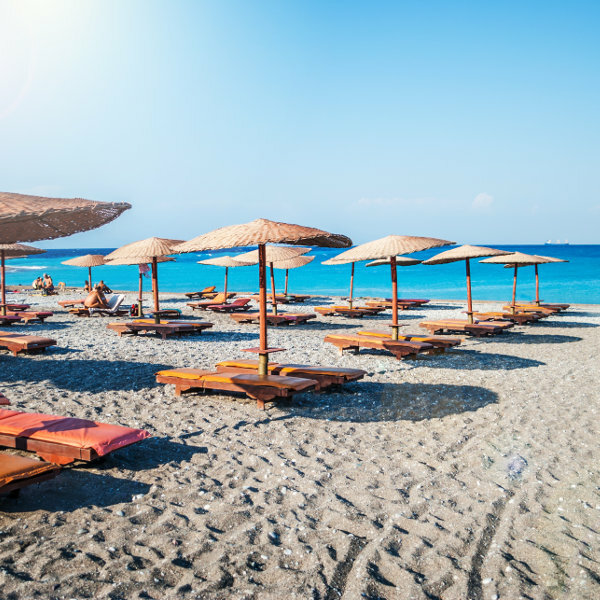 Prepare to be captivated by magnificence with cheap flights to Rhodes for a limited period of time! Rhodes is home to Rhodes International Airport (RHO), located on a 35-minute drive from the city centre. The wonderful sea views and beaches, from golden to pebbled, found on the island of Rhodes is exactly what so many flock to see and enjoy. The island boasts a beautiful variety of architectural styles and designs, from the Acropolis of Lindos to The Palace of the Grand Master in Old Town. Weekend mornings are reserved for the wonderfully diverse markets that you will find on the island. Be prepared to be amazed as you pick up tasty bites and Greek trinkets. The island of Rhodes is especially great for visiting as it has the longest summer season in all of Greece. 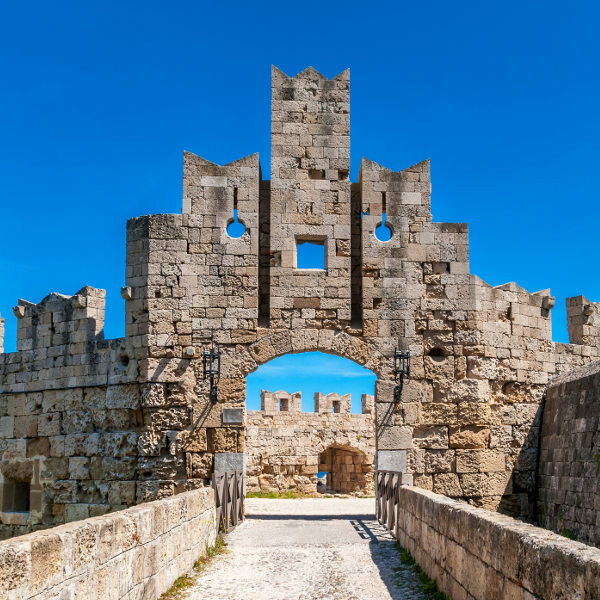 The best time to visit Rhodes is between the months of April and November, while there is plenty of sun out and the city is bustling with happy people sightseeing and taking in the sights. Between the months of December and March is considered low season, and there are less ferries available from the Greek mainland to the island. It is, however, not cold at all during this time and visitors can enjoy a more relaxed atmosphere. Rhodes is a magnificent island that is just a quick flight or ferry ride from its mainland, Greece. The island is known for its stunning natural beauty and is a popular tourist destination for those looking to explore and wine and dine, surrounded by beauty. Rhodes is also an architectural dream with ancient palaces and remnants of great times gone by. The Old Town is where you’ll still find cobbled streets and tall structures, now home to museums and galleries. The wonderful beaches range from popular, golden sanded masterpieces and crystal water such as Kalathos and Lindos Beach, to more secluded and intricately rocky beaches such as Anthony Quinn and Ixia beaches. Each have wonderfully warm waters and plenty of picture opportunities to take advantage of. You’ll be spoilt for choice when it comes to the array of merchandise on display at the various markets around Rhodes. Popular market days are Wednesdays, Saturdays, and Sundays, and it is then that you’ll be able to sample some of the freshest seasonal fruit and dishes, as well as pick up some curios as Rhodes souvenirs. Compare several airlines and book your cheap flights to Rhodes online with Travelstart! 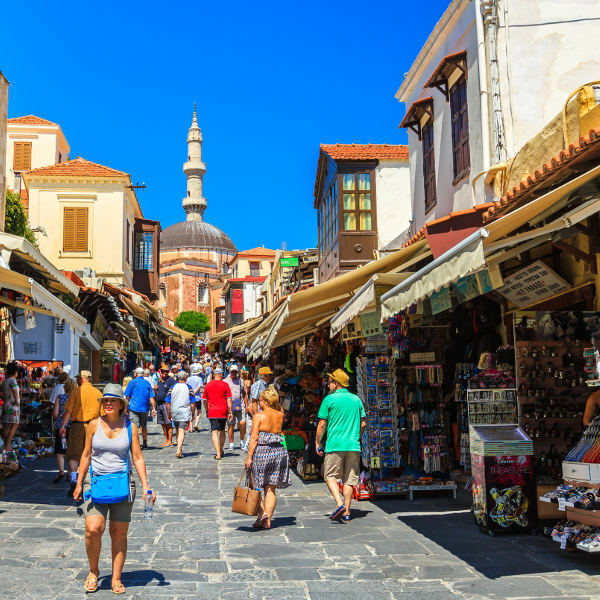 Rhodes is considered a safe destination to visit, with almost zero reports of any kind of violent crime and low reports on petty crimes like pickpocketing. As Rhodes is a very popular tourist spot, it would be a good idea to remember to be alert of thieves and perhaps keep your important documents in the hotel safe instead of walking around with them. There are no required vaccines for your trip to Rhodes in Greece, but it is advised to visit your doctor ahead of all international travel and get your regular vaccines, such as a yearly flu shot, measles-mumps-rubella (MMR) vaccine, diphtheria-tetanus-pertussis vaccine, varicella (chickenpox) vaccine and the polio vaccines.